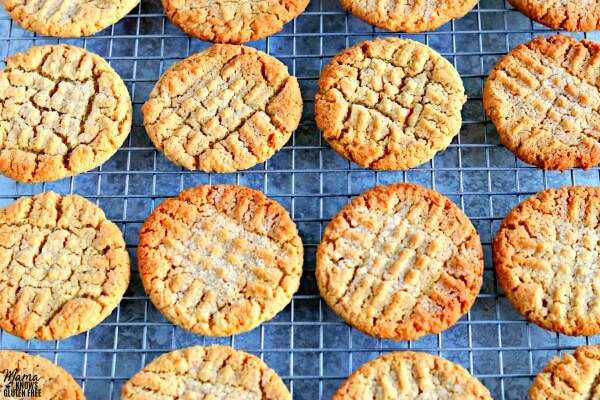 These are the best gluten-free peanut butter cookies! They are soft, chewy and a little crisp around the edges. The recipe also has a dairy-free and Vegan option. My mom baked a lot when I was a kid. We never had store-bought cookies, so she always made homemade cookies. 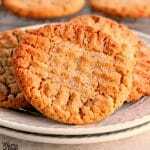 One of my favorites flavors that she made was peanut butter cookies. 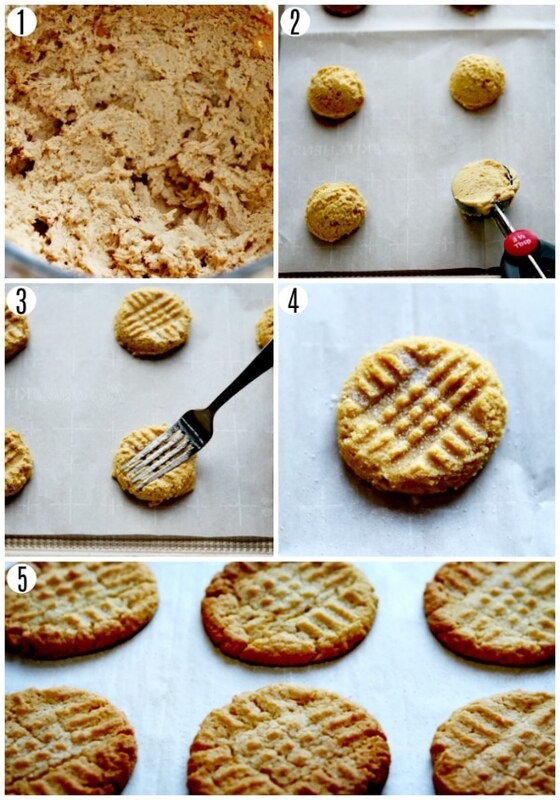 This is a super easy gluten-free peanut butter cookie recipe! It only requires a few simple ingredients and can be made in less than an hour. Add the granulated sugar, brown sugar, butter, and peanut butter to a large bowl and mix with your mixer until fully combined and creamy. Mix in the egg (or egg replacer) and the molasses. Mix until fully combined. In a medium bowl add the gluten-free flour, xanthan gum (leave out if your flour already has it) baking soda and baking powder and stir to blend ingredients. Slowly pour flour mixture into the batter and mix until fully combined. The cookie dough will be like soft playdough. Allow the cookies to cool completely. Store in an airtight container. Enjoy! Always use a cookie scoop. I use a 1 1/2 tablespoon cookie scoop. It was a game changer for me! I also like to use Reynolds Kitchens Cookie Baking Sheets. It has a smart grid that makes it super easy to line up your cookies on your baking sheet. I buy it at Walmart. To bring your egg to room temperature, add very warm, but not hot, tap water into a bowl. Place your cold egg into the water gently. Wait five to seven minutes. I have also included a dairy-free option for the recipe. My husband, myself and youngest son are all dairy-free as well. 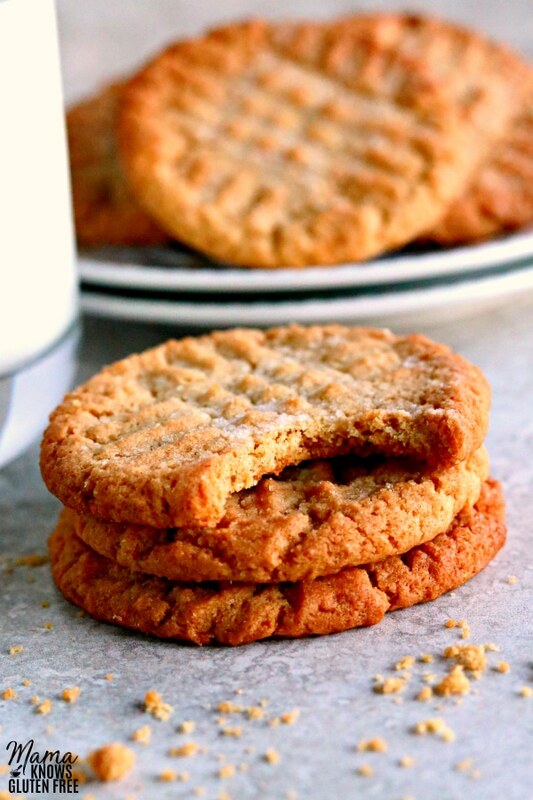 So now, you too can enjoy a gluten-free and a dairy-free peanut butter cookie. For the dairy-free version of this recipe, I used Smart Balance butter. We recently found out that my husband has an egg sensitivity. So, I am learning to bake egg-free now as well. I used Bob’s Red Mill Egg Replacer, which is also gluten-free. They turned out great! I made them both dairy-free and egg-free, so they would also be Vegan gluten-free peanut butter cookies. So, if you also need to be egg-free or are Vegan, you too can enjoy my gluten-free peanut butter cookies! 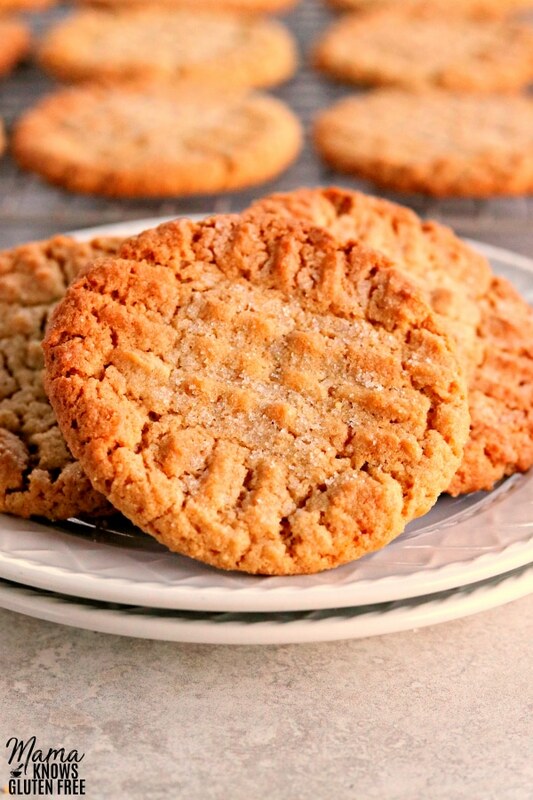 These gluten-free peanut butter cookies are a classic. They are so easy to make and simply delicious! Love Peanut Butter And Chocolate? 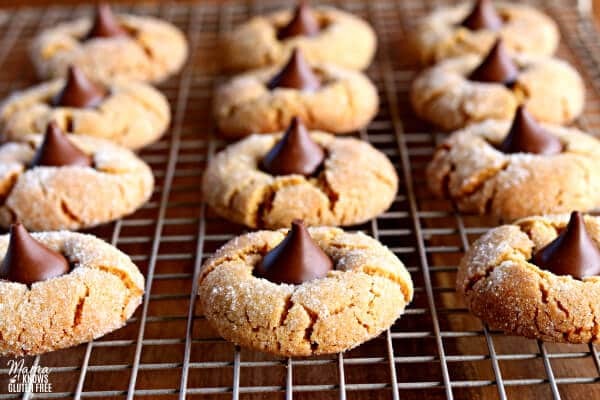 Make Gluten-Free Peanut Butter Blossoms! More Gluten-Free Cookies For You To Try! 1 1/4 cups gluten-free all-purpose flour I like Pillsbury gluten-free flour. Not all gluten-free flours are created equal. You may experience different baking results depending on the gluten-free flour blend you choose. In a medium bowl add the gluten-free flour, xanthan gum (leave out if your flour already has it) baking soda and baking powder and stir to blend ingredients. Slowly pour flour mixture into the batter and mix until fully combined. The cookie dough will be like soft playdough. Cover cookie dough and refrigerate for 30 minutes. Scoop 1 tablespoon of dough and roll into a ball. (I used a 1 1/2 tablespoon cookie scoop.) Place onto a parchment-lined baking sheet 2 inches apart. Add the tablespoon of gluten-free flour into a small bowl. Dip the bottom of your fork into the gluten-free flour and then press down on the tops of the cookies to make a crisscross "x" shape. To bring your egg to room temperature add very warm, but not hot, tap water into a bowl. Place your cold egg into the water gently. Wait five to seven minutes. I also like to use Reynolds Kitchens Cookie Baking Sheets. It has a smart grid that makes it super easy to line up your cookies on your baking sheet. I but it at Walmart. For dairy-free I used Smart Balance butter. For egg-free/Vegan I used Bob's Red Mill egg replacer. 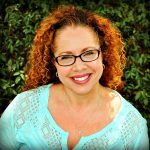 Thank you Linda for the wonderful 5-star recipe review! I am so happy that you enjoyed the peanut butter cookies. They are one of my family’s favorites. Thank you again!